American Ron Freeman won gold and bronze medals in track at the 1968 Summer Games in Mexico City. But the former Olympian says his greater legacy is the youth fitness and mentoring program he and his West African wife started here. "I'm trying to build something that lasts longer than me," said Freeman, who is 67. What he, Mariama Sy Freeman and their team have built is an after-school program that trains girls in double Dutch jump rope and teaches young men and women to become coaches and mentors. The Freemans’ nonprofit International Medalist Association supports recreational team sports for thousands of Guinean girls ages 6 to 17 who traditionally get little physical exercise beyond housekeeping, walking or dancing. In the crowded capital city of one of the world’s poorest countries, "there are no Boys and Girls Clubs," Ron Freeman said. "We’re giving girls an opportunity to play – and with double Dutch, it’s a team sport," he added. Their play is about to resume after a long interruption provoked by the deadly Ebola virus. Fear of contagion shuttered Guinea’s public schools until January 19 – long after the usual July-August break – and halted the jump rope program. But Freeman said three training camps are scheduled for next Wednesday in the capital to kick off regular practices, with other camps slated elsewhere in the country in the following weeks. Two dozen girls participated when the fitness program began in 2011, the founder said. Last year, 8,000 jumped and spun ropes in greater Conakry and a handful of other communities, with more than 1,000 of them joining in the annual late-spring national championship. At least 40 "mentor coaches" – mostly male, including some teachers – lead the training at 200 or more schools, encouraging fitness, academics and healthful behaviors. Sy Freeman, as national director, works with her husband to coach them in leadership and teaching skills, professional conduct, responsibility and punctuality. Mentors get modest stipends for part-time jobs that, for some, represent an introduction to the paid work force. While mentors routinely speak with their young charges about the importance of getting an education or delaying childbearing or addressing gender violence, in the coming season they’ll also grapple with Ebola. The number of new cases has declined, but the epidemic has not been snuffed out. "Our new mission is making sure the kids understand the seriousness of Ebola – and at the same time understand how Ebola can be beaten," Ron Freeman told a dozen new and returning mentors gathered in the shady grove of a Conakry schoolyard one Sunday afternoon in late September. The mentors studied an Ebola-prevention handout, in French, with diagrams advising hand washing and warning against eating uncooked bush meat. Nearby, two dozen girls twirled ropes, jumped and chattered. Some hugged after executing difficult turns, momentarily forgetting the unwritten Ebola-era ban on casual touching. But the others’ scolding and clicking tongues reminded them. Marie-Rose Nyundu Tonguino, 15, originally came from Gueckedou, a town in the southeastern Forest Region where the outbreak began and where she said "two or three" of her relatives have died of Ebola. "In my family, I have to wash my hands" with bleach solution before entering the house, said Marie-Rose, who lives with her grandmother, aunt and cousin. Her friend, Masona Turay, said she had "advised people about Ebola on Facebook." In the months between that fall afternoon and the start of school, a few of the girls got together weekly to study and to keep up their conditioning. "We’re training with some other kids but not mingling too much because of Ebola," said Masona, recently speaking by phone from Conakry. Now 18, she plans to become a mentor after several years as a competitor. They’re trying to replicate some of the more complicated moves they’ve seen on videos, including one for Beyonce’s "Move Your Body." "We watch videos and at times we invent things," Marie-Rose said in a separate conversation. Ron Freeman has encouraged such efforts. "There’s an intrinsic value that kids learn from playing together," he said. "You learn how to challenge yourself, how to take a loss." He absorbed that lesson early in life. "I learned how to handle that because I was skinny and had glasses since I was 6," added Freeman, who was born prematurely, with a heart condition. Though he wasn’t a natural athlete, he was determined. And at 21, the New Jersey native went on to win gold in the 1968 Summer Games with a record-setting performance in the 4x400 relay. He also won bronze in the 400-meter dash. Freeman’s route to Guinea came by way of athletics and academics. A political science major who earned a master’s degree in education, he worked with youngsters in poor communities in New Jersey and Maryland. By 2000, he’d founded the International Medalist Association to support youth recreation. His achievements brought invitations to do training abroad from the U.S. State Department, the United Nations, Rotary International and other groups interested in sports and youth diplomacy. Guinea’s government asked Freeman’s association to develop regional "peace games." When the plan fell through in 2006, "I decided to stay to develop and implement a program that could have an impact on Guinea youth," Freeman said. 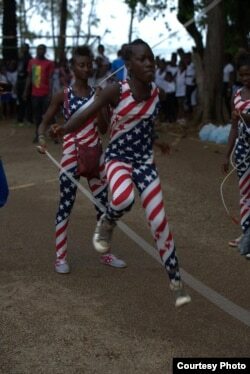 The double Dutch program, endorsed by Guinea’s Ministry of Education, has a handful of sponsors including UNICEF, the U.S. Embassy in Guinea, the Guinea Alumina Corp., TOMS Shoes and several other businesses. The U.N. reports at least 5 million of Guinea’s 12 million residents are younger than 15, vital to the fledgling democracy’s future. Embassy spokeswoman Kimberly Phelan said Freeman, as a former Olympic medalist, "is uniquely positioned in this country to express the values of American sports in Guinea and implement the sports themselves." Through the International Medalist Association, "we’ve been really lucky in having … the opportunity to engage in issues such as family planning, leadership skills, health issues and the like," Phelan said by phone from Conakry. She also praised a "mini-scholarship program" that will award athletic shoes to jump rope participants who’ve demonstrated they’re keeping up with academics. California-based TOMS has pledged 18,000 pairs of shoes to be distributed through the program. The first batch was delivered this week. "For many of the 150 girls … it was their first pair of shoes," Freeman wrote in an email. Neither Phelan nor Ron Freeman would disclose the embassy’s level of financial support. But Freeman said the embassy has been instrumental in furthering his program’s efforts to help girls advance, including sending Marie-Rose, Masona and their friend, Ruth Sesay, to a six-week pan-African leadership program in the United States last spring. "I signed up for jump rope because it keeps me healthy, and through jump rope I learned to be a leader," Masona said. And that, Freeman said, is his program’s goal: "We try to create leaders."